Locomotive bed, rear engine, Union Pacific "Big Boy"
This is a Fusion 360 model of the locomotive bed (frame) for the rear engine of a Union Pacific 4-8-8-4 "Big Boy" steam locomotive. I worked from the original drawings which are available from the Union Pacific Historical Society. I think this may be my seventh or eighth pass at modeling this structure (and the companion front engine). It now takes me about three to four weeks to work my way through one of these models. I've included a number of images showing the various stages of model development working from the draw bar structure forward to the cylinders and articulation hinge. I hope they suggest how complex the actual structure was and how sophisticated the Union Pacific and American Locomotive Company (ALCO) engineers were back in the late 1930's in terms of putting metal only where it was needed to achieve strength and stiffness without adding unnecessary weight. As I understand it, the Big Boy (among others) was bumping up close to the Union Pacific's per-axle weight limits, so keeping the weight down was, oddly enough, a priority. 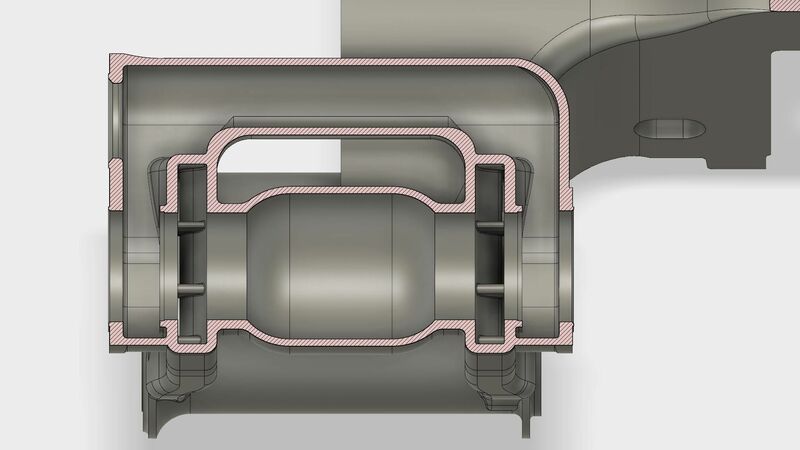 The two cross-sectional images show the steam path through the piston valve chamber to the cylinders and the steam exhaust path. I admit that the steam paths are still not quite right based on what I see in the drawings, but I just can't quite make complete geometric sense out of what I think the drawings describe. Regrettably, the Union Pacific of that era was just not into isometric or perspective views. For the most part, only the left side of the frame is modeled. The whole is made by generating a mirror image and joining the two halves together. Things that appear only on one side are identified through a selection set and are added (or removed) after the mirror/join action. For example, there is a working steam pressure tap on the upper portion of the valve body about nine inches aft and eight inches inboard of the main steam supply port in the center of the valve body. This port exists only on the right side of the engine, although that may be hard to verify from these images. The body, identified in an "after mirror add" selection set, is added to the model after the main mirror/join operation, and the passage through that body into the valve chamber is identified through another selection set for a subsequent "cut" operation. All of the images were generated in the Fusion 360 rendering environment. I've benefited from the rendering tips and deep dives on the Autodesk Fusion 360 YouTube channel. I generally turn off the ambient lighting of the rendering environment and illuminate the scene with lighting panels using the various emissive appearances in the appearance library. I have no training in photography or the graphic arts, so my use of the environment is no doubt amateurish. 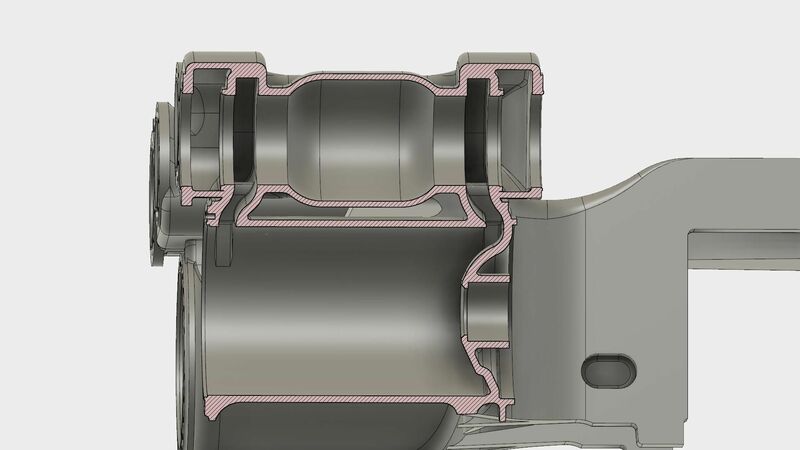 I've been working with Fusion 360 for a couple of years now and came to it with no previous CAD/CAM experience. My employer called me an "Aerospace Engineer", but that was mostly a political/bureaucratic thing. I was really more into software research looking at technical integration technologies and my work was drifting toward artificial intelligence of a sort. Per the request of Prabakar Murugappan, here is a link to an isolated version of my model. The link is to a "Save As..." copy of the model since I am still working on the original. I regard the model as covered by the copyright statement in the first A360 comment attached to the model. You are good for the purposes of learning, instruction, debugging, and the like. If you can somehow make a fortune from it, I'd probably like a piece of the action. If you want to play around with the model, please be considerate of others and make your own, private copy. We need to talk. I am capable of up to 200lb of iron from a tilting furnace. I would at least like a copy of the drawing to break out portions to cast. Nice work Bill. Looking forward to seeing your casting. Any chance you can share this model with us. Thanks.